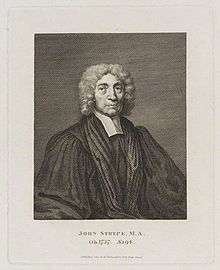 John Strype, engraving by William Richardson. John Strype (1 November 1643 – 11 December 1737) was an English clergyman, historian and biographer. He was a cousin of Robert Knox, a famous sailor. Born in Houndsditch, London, he was the son of John Strype, or van Stryp, a member of a Huguenot family who, in order to escape religious persecution within Brabant, had settled in East London. Located in what has now become known as Strype Street in Petticoat Lane, he was a merchant and silk throwster. The younger John was educated at St Paul's School, and on 5 July 1662 entered Jesus College, Cambridge; he went on from there to Catharine Hall, where he graduated B.A. in 1665 and M.A. in 1669. On 14 July 1669 Strype became perpetual curate of Theydon Bois, and a few months afterwards curate and lecturer of Leyton in the same county. He was never instituted or inducted to the living of Leyton, but in 1674 he was licensed by the Bishop of London to preach and expound the word of God, and to perform the office of priest and curate while it was vacant, and until his death he received the profits of it. In 1711 he obtained from Archbishop Thomas Tenison the sinecure of West Tarring, Sussex, and he discharged the duties of lecturer at Hackney from 1689 till 1724. At the latter place he spent his last years with a married granddaughter, the wife of a surgeon, Thomas Harris, dying there at the age of 94. He was buried in the church at Leyton. Through his friendship with Sir William Hicks, Strype obtained access to the papers of Sir Michael Hicks, secretary to Lord Burghley, from which he made extensive transcripts; he also carried on an extensive correspondence with Archbishop William Wake and Bishops Gilbert Burnet, Francis Atterbury and Nicholson. The materials he obtained were used in his historical and biographical works, which relate chiefly to the period of the Protestant Reformation. Most of his original materials have been preserved, and are included among the Lansdowne manuscripts in the British Museum. His works are not really original in nature, his work having mainly been to arrange his materials, but as a result they were of considerable value as convenient books of reference. Ecclesiastical Memorials (5 vols., 1721; 3 vols., 1733). His Historical and Biographical Works were reprinted in 59 vols. at the Clarendon Press, Oxford, between 1812 (Cranmer) and 1824 (Annals). A general index by Robert French Laurence in 2 vols. was added in 1828. Strype also published, besides a number of single sermons, an edition of John Lightfoot's Works (1684); and in 1700 Some genuine Remains of John Lightfoot ... with a large preface concerning the author. ↑ "Strype, John (STRP662J)". A Cambridge Alumni Database. University of Cambridge.